Child of Storm is an Allan Quatermain adventure and the second novel in the trilogy including Marie (1912) and Finished (1917). 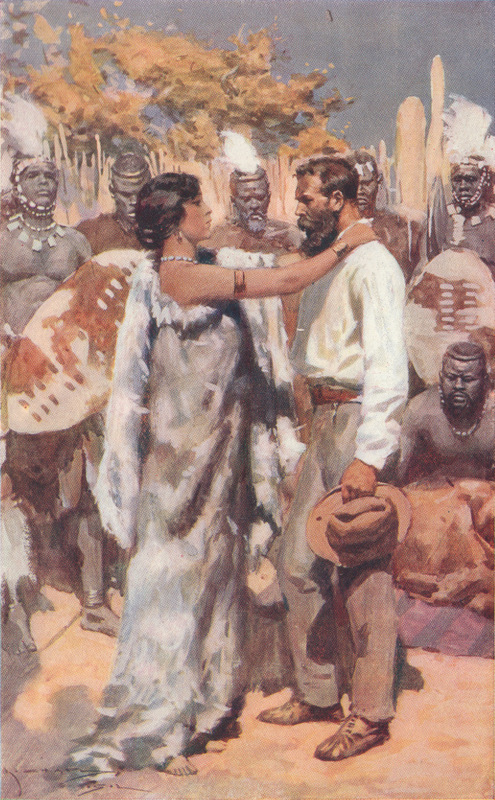 In this African romance the contest between princes Umbelazi and Cetywayo for the throne of Zululand acts as a backdrop for the love affair between Quatermain and the "Zulu Helen" Mameema. Cassell and Co., London, published the first edition of CS on 23 January 1913. This edition included three full-page illustrations by A. C. Michael including a colored frontispiece. 13,500 copies issued, followed by another 20,000 in September 1914. The Longmans, Green and Co., New York, 1st US edition, published 6 February 1913, has identical illustrations as the Cassell edition. Tauchnitz of Leipzig published a copyright edition in 1913. McKinlay, Stone, and Mackenzie, New York, published an edition in 1913 that includes only a frontispiece by Michael. Macdonald & Co., London, published an edition of CS illustrated by Hookway Cowles in 1952, 1st thus, with a 2nd imprint appearing in December 1958. Haggard, H. Rider. The Days of My Life, An Autobiography. 2 Vols. London: Longmans, Green and Co., 1926. I:76-77; II:207. Pocock, Tom. Rider Haggard and the Lost Empire. London: Weidenfeld and Nicolson, 1993. 167, 173, 185. Whatmore, D.E.. H Rider Haggard: A Bibliography. Westport, CT: Meckler Publishing Co., 1987. F40, 56-57. 1st UK edition. London: Cassell and Co, 1913. Reprinted Edition. New York: McKinlay, Stone & Mackenzie, 1913. 1st US Edition. New York: Longmans, Green, and Co., 1913. 1st Edition Thus. London: Cassell & Co., 1933. Macdonald Illustrated Edition, 2nd imprint. London: Macdonald & Co, 1958.